Tasked with re-energising this family home in Crouch End, Mulroy Architects have introduced an abundance of light using walk on fixed rooflights transforming the centre of the property. 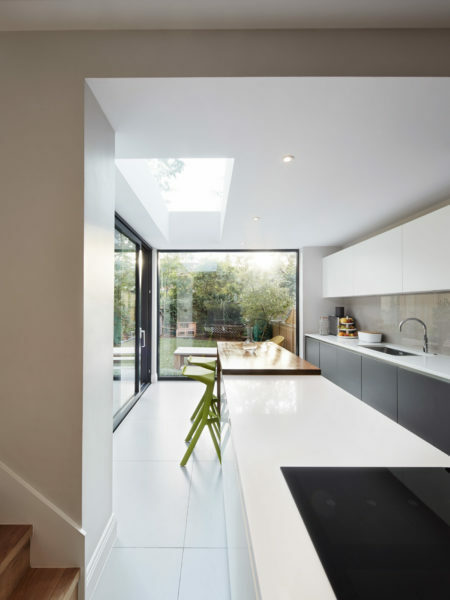 The new open plan arrangement has increased functionality, maximised daylight and opened up views out onto the rear garden of this Victorian Terrace house. The extension and full house renovation did away with the existing rear outrigger and dormer roof conversion that were well below current standards. The ground floor has been opened up and floor levels resolved to improve the liveable space, whilst maintaining the character and appearance throughout. A series of interlinked spaces have been designed to replace the heavily compartmentalised layout that had previously hindered the potential of the property with poor spatial qualities, uninspiring views and inadequate lighting. One of the most impressive aspects of the development is the new kitchen housed in the rear ground extension. Granted under permitted development rights, the modern addition is walled with large areas of glazing allowing for an abundance of natural daylight, achieved with a combination of feature glazed doors and a large rooflight situated above the central kitchen island. 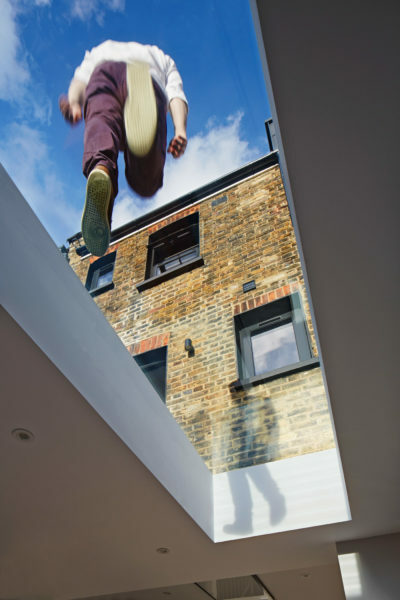 The rooflight itself has a party trick – Mulroy wanted to utilise the roof space above the kitchen as a terrace, but still include a rooflight as part of the scheme. A Glazing Vision walk on specification rooflight was detailed, meaning that the glazing forms part of the roof structure, and can be safely traversed by those using the terrace. Having worked previously with Glazing Vision, the challenges of ensuring a flush finish and drainage with such a small pitch, were quickly muted through the experience and technical advice provided by Glazing Visions technical specification team. The 1140 x 3015 mm fixed walk-on rooflight was able to provide more than just the natural daylight that had been required, offering attractive views to the sky from within the plan due to the frameless design of the rooflight and maximising the usable space on the first-floor balcony for the clients. Engineered by Glazing Vision with a 25.5mm clear laminate outer pane, 14mm Argon filled warm edge spacer cavity, and 6mm heat soak tested toughened inner pane, the walk on rooflight is designed to meet the future projected foot traffic upon them with uniform loadings of 1.5kN/m² and concentrated loadings of 2.0kN in accordance with BS EN 1991-1-1-1:2002. Andrew Mulroy from Mulroy Architects explains “the client was very pleased with the rooflight and it delivered everything that was set out in the brief”.